The idea that Russia’s many current woes stem from its incomplete de-Stalinization is so widespread as to be banal. It is also correct. Just two months ago, I stared agape at the newly restored name of Stalin coiling around a neoclassical portico at the Kurskaya metro station in Moscow. The name had its own security guard: look up at those six letters for more than a few seconds, as I did, and he would saunter closer. A few weeks earlier, Stalin had been leading a national poll for Russia’s “greatest name.” After some careful counting and recounting, he ended up in third place, still handily beating out Pushkin and Dostoevsky. 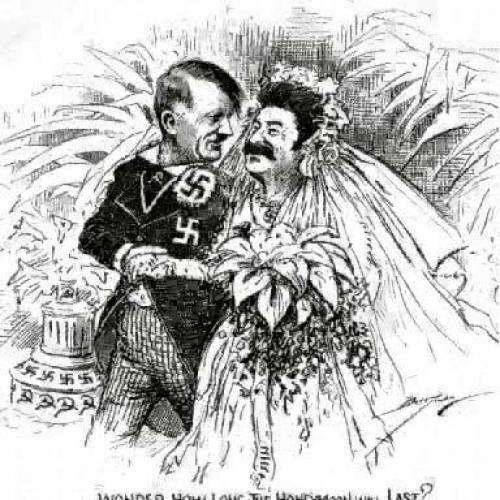 As the current Russian administration’s bizarre and revolting ambivalence over Stalin’s legacy bubbles up into the news and onto the architecture, Karen L. Ryan’s new study, Stalin in Russian Satire, 1917-1991 is certainly timely. It is a welcome reminder that the Soviet people (a more correct title, given the dates, would be “Stalin in Soviet Satire”) did not uniformly adore or fear the tyrant; that, indeed, a great deal of literature, popular song and oral lore were devoted to ruthless mockery of him—even, incredibly, in the times when one incautious dinner-party remark could mean a midnight arrest, a forced confession, and decades in the camps. Sadly, this well researched and imaginatively sourced book is also rendered near-poisonous by a single but fundamental distortion that informs every page. Ryan, an American professor of Slavic languages and literatures, has found an original hook for her study: Russian lampooning of Stalin, she argues, is not just the fatalistic gallows humor of an oppressed populace with a long history of fatalism and gallows. It is reflexive self-exoneration of the guilty collective mind, a way of externalizing the oppressor. “By showing that Stalin could not have been part of Russian culture,” writes Ryan, “…satire often functions to affirm the health and soundness of that culture.” If Stalin is alien, he is not I; and if he is not I, I bear no responsibility for his reign. This is a valid point, of course—it is just not the only point. By making it the centerpiece of the book, she succeeds in turning the mockery of a tyrant—one of the bravest deeds available to an artist living under tyranny—into an act of, well, cowardice. Stalin in Russian Satire is organized, rather intriguingly, by literary device as opposed to era or genre. The first chapter, “The Insanity Defense,” collars some of the work in which Stalin is depicted as a raving madman, infecting the country with his delirium. The next and most amusing chapter, “A Bestiary of Stalins,” displays veiled descriptions of the dictator as the titular critters in Kornei Chukovsky’s Aesopian children’s poem “The Big Bad Cockroach” and Bulat Okudzhava’s 1966 song “The Black Tomcat.” “Stalin in a Dress” deals with perhaps the most usual and obvious way of denigrating a tyrant, “The Monster Lurks Within” examines Stalin as a dragon and a steel bird, and the final two chapters discuss Stalin’s somewhat linked depictions as the Devil and the undead. The resulting mustached menagerie is almost overwhelming. Here is Stalin thawing out from cryogenic sleep in 1974, swooping down from the skies as a flying transvestite, fighting his own rebellious foot; if “the sleep of reason produces monsters,” per Goya’s etching, these are the nightmares that follow. The range of sources on which Ryan draws is remarkable, from marquee names (Vladimir Nabokov, Aleksandr Solzhenitsyn) to the figures relatively obscure in the West, such as Yuz Aleshkovsky and songwriter Aleksandr Galich; the inclusion of Evgenii Shvarts, a playwright of biting and brilliant allegories who easily deserves Bulgakov-size fame, alone makes the book worth reading. At the same time, Ryan is hobbled at every turn by her own high concept, the sole prism through which she sees all satire of Stalin: his manufactured “alterity,” a postgrad term for otherness. “Exclusion—casting Stalin as other in respect to the cultural self—is a particular mechanism supported by Russia’s essentially Manichaean worldview,” she asserts in the introduction, the first of many, many iterations of the same thought. Ryan’s toolkit is Lacanian, with dashes of Tzvetan Todorov: she sees the Other everywhere, undertaking a great deal of logical contortion in the process. Let’s look past the author’s academese, which verges on self-parody (would that cannibalism ate anthropophagy); the assertion is nonsense at its very root, because it switches subjects from the wolves to the cockroach halfway through. Saddest of all, the cited couplet is in fact a perfect, succinct satire of the Russians’ behavior under Stalin—the self-destructive culture of stukachestvo, or ratting out the neighbor; the people were so afraid they indeed ate each other up. But this, of course, directly contradicts Ryan’s big thesis—it accepts and internalizes blame exactly where she prefers to see deflection. In Ryan’s eyes, Russian satire of Stalin exists to address the “painful question of guilt, complicity, and responsibility,” and largely fails at it. In this single-minded focus, the author appears to have forgotten the basic mechanisms of her very subject. The first rule of satire, everywhere, always, is that you work with what you’ve got. In the case of Stalin, this meant a mustache, pockmarks, a withered left hand—a handicap as unacknowledged and as well-known as FDR’s polio—and, yes, that thick Georgian accent. (Oddly, Ryan all but omits Osip Mandelstam’s famous “Stalin Epigram,” the suicide bomb of a poem whose characterization of the dictator as a “Kremlin highlander” certainly plays into the exoticism motif). Put it this way: if Stalin were grotesquely obese, the same lore would paint him as a whale, hippopotamus or a dirigible. Or, as is the case with the protagonist in another of Kornei Chukovsky’s rhymed fables, a walking, hectoring washtub. In addition, the mustached Stalin was incredibly easy to turn into either a cat or a cockroach because of a linguistic quirk, one that Ryan knows and acknowledges: in Russian, the word usy means “mustache” as well as “whiskers” and “feelers.” The human-mustache meaning is at the center of that cluster, however, so both the cat and the cockroach, in the Russian mind, are by default mustached. Reaching for Lacan to connect Stalin to a cat through the latter’s unknowable alterity is a classic case of forest-for-the-trees hyperacademism. The man looked like a cat. Every person living in his hell knew that.